As the fighting with Hamas in Gaza continues into its fourth week, some rays of sunshine are sprouting forth amidst the clouds of conflict. Last week Wednesday, IDF soldiers, many of whom come from disadvantaged or low income families, received a special surprise. Karmey Chesed, a non-profit organization in Israel dedicated to helping those in need. The packages came as a complete surprise, as the organization, just a week prior had been involved in a similar delivery to the another part of the same brigade. "No one expected it," said Shosh, the Welfare NCO of the unit. "Most of the soldiers have not been home for 45 days and were lacking basic essentials such as clean socks, towels, and other basic hygienic items. They received all of the required items from Karmey Chesed, and it was a complete surprise." The unit (whose name cannot be mentioned due to security concerns) has been in and out of Gaza over the last three-to-four weeks. Soldiers who enter Gaza and head into active combat situations are permitted furlough out of the Strip every so often for some rest and relaxation. 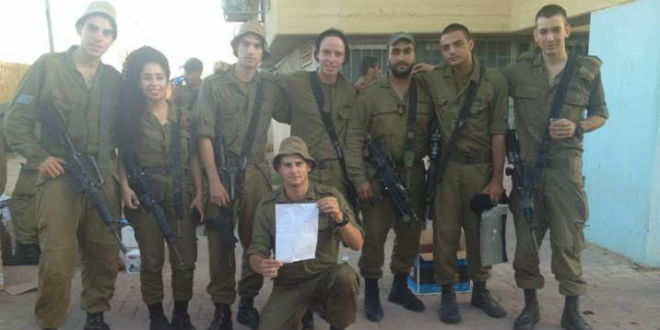 Karmey Chesed is not just providing for the hygienic and physical needs of the soldiers, but they are also trying to take care of their spiritual and psychological needs. The packages, which were presented to each soldier in the unit, included a copy of the Bible. After seeing the sheer amount of packages, one excited soldier exclaimed; "I cannot believe how many gifts and products are here. The nation of Israel is really caring for and looking after us." According to the unit's Welfare NCO, the delivery was met with smiles and an outpouring of gratitude from the soldiers. "They know that they can count on someone to look after them, and that there are people out there who are rooting for them and will take care of them, and that is a huge benefit to their morale and their psychological well-being. Even in a time of great stress, and a lack of provisions from the army, they know that they will not go wanting," Shosh explained. The NCO expressed her own gratitude and thanks to Karmey Chesed Director Aryeh Weingarten and said; "All that I have to do now is to thank them and hope that the relationship between the people of Israel and the IDF will always stay this unified. The power of Israel is in its unity and friendship."